The Fate team helped my fiancé and I find our dream home and I could not say enough great things. They held our hand through the entire process and made it a fun experience. They went to bat for us multiple times and you will not find a team who cares more about their clients! Megan D.
Wonderful team of real estate professionals. Smooth, easy process with Megan & Karen. They assisted in every step of the buying process and after with further resources on home maintenance. Robin R.
We couldn't be happier with Karen Fate and her team. They were beyond professional and sold our home in 1 week! They made the entire home-selling process an ease and walked us through each stage, giving us peace of mind knowing we made the right decision to go with them. I would highly recommend them to any seller! Thank you Fate Team! 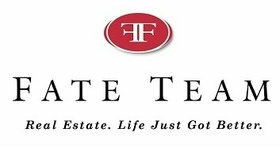 Tiffany S.
I had the pleasure of working with Megan Jordan at the Fate team to buy my first home. She was definitely the best real estate agent for a guy like me who had lots of questions. She was patient, kind, caring, and very trustworthy throughout the process. Her vast network of vendors also saved me TONS of money on my loan and home owners insurance, it also saved me TONS of time and hassle. I would refer her to any of my friends or family again in a heartbeat. Kevin C.
Anyone and I mean anyone who needs a realtor should hire Megan and the Fate team! Megan was extraordinary as she helped us buy a new construction home! Megan was highly responsive, patient, authentic and always kept our needs at the center of every negotiation. She was highly knowledgeable about all aspects of our transaction. We had almost unattainable expectations and she blew them all out of the water!! We recommend her to everyone we know, you’ll only wonder why you hadn’t found her sooner. Sara R.
I couldn't have asked for better service! Megan has treated me as if I was her most important client and gone way beyond her basic duties in finding me a home and helping me get settled. Her knowledge of the area really helped me find the best area for my lifestyle. After my purchase transaction was finalized Megan's contributions weren't done as she helped w/finding and overseeing contractors for my renovation needs, insurance and even consignment of some of my furniture pieces I no longer needed. Mark B. "We couldn't be happier with Karen Fate and her team. They were beyond professional and sold our home in 1 week! They made the entire home-selling process an ease and walked us through each stage, giving us peace of mind knowing we made the right decision to go with them. I would highly recommend them to any seller! Thank you Fate Team!" Tiffany and Rob V.
Thank you so much for all your help and for being patient and answering all my questions. I learned so much from this experience. It was a pleasure working with you! Alex G.
We were totally blessed to have Karen help with both the sale of our home and with her patience to help us close on our new home. Awesome realtor and by far the best – I have sold and bought homes in 5 states! Nora B.
Karen’s extensive knowledge of South Tampa continues to be an invaluable guide to us. It was so helpful to use when we first moved here not knowing all the nuances of a new city; and continues to be valuable as we are in constant renovation and always in need of a good contractor. Helping us figure out the best public schools in our area for our children when we first located mid-school year was so appreciated too. You helped us find a more than a house, but a neighborhood. We continue to love our location and fell like we made an excellent choice with all of the new development going on around us. We can’t thank Karen enough for being a constant resource for us after purchasing our home with you in 2007. We appreciate you making yourself available to us even after the sale. Just this year we’ve put on a new roof, painted and added gas lines, all using superior contractors Karen has used and recommended! Karen has many outstanding realtor attributes – knowledgeable and hardworking but also, we just enjoy your company! When you spend 12 hours a day together over several days, you need to really like your realtor, and we do! We have no plans to sell our home but will sign on with you when we do. WE’re happy to speak to any prospective clients to discuss your services in the meantime. We appreciate all that you do and your friendship, Karen. Michael and Holly H.
Now that the dust and craziness has settled from moving and unpacking, I just wanted to take the time again to thank you again for everything you helped me with during my first home buying experience. You truly took the time to help explain everything about hte process to me, look out for my best interests, provide unbiased advice and make my first home buying experience memorable, and as stress-free as it possibly could be. Michael W.
Just wanted to thank both of you again for working hard to get this done. I know it was difficult closing in such a short period of time with the holidays smackled right in between. Thanks for your hard work. I appreciate it. Joe O.
David and I appreciate your professionalism and above and over the top efforts to sell our home. The entire experience was so easy and effortless because of you. My only regret is that I won’t see you as often. Karen, we truly appreciate and just adore your thoughtfulness in taking the time to pick such lovely gifts for us. Thank you very much. We are slowly getting settled and enjoying it. Michelle and David W.
Thank you so so much for getting me the hammock! I absolutely love it and it’s going to be great! Also, thank you for finding us the perfect house! I am so excited about it! I can’t tell you enough how thankful I am for all you have done for my mom and I! We love you! Mary H.
You are a miracle worker! Thanks for everything!! Samantha P.
Words can’t express how thankful we are that you helped us find our “perfect” home. Throughout our journey you have pu tin a lot of hard work and have beome a friend. We know we can never give you back the family tiem you lost while helping with our search. Thank you from the bottom of our hearts! Michelle M.
I just wanted to say thank you once again for all your help. I truly appreciate your thoughtfulness and kindness. You are a true professional and at the same time, you treat your clients as if they were family. That is indeed admirable and rare these days. Thank you again! Alina S.
Karen is the commensurate professional. No detail is too small nor does anything get passed her. She combines local knowledge, refined business acumen, and true caring about you and your purchase to deliver unparalleled service. Her assistanace in our relocation to South Tampa provided us with everything we needed along the way to get us into our home. Her tireless efforts throughout the search, the purchase process and after were the best we have experienced in the 20+ years we have been relocating throughout the world. Will recommend her to all without reservation; I wish all relators were this good. Garth P.
Thank you, Karen! I don’t think these things would have been done so quickly without your diligence and hard work. I really appreciate your help and once again you have restored my faith in the real estate industry. Ann L.
Thank you! Thank you! Thank you! You went above and beyond by helping us with the condo. We are so grateful to have you as our agent and friend! Emily and Eric S.
I have purchased two condos and sold one of those condos through Karen since 2012. I cannot tell you how lucky I was to have found her as a realtor and mentor throughout both the buying and selling process. She’s an amazing person on both a personal and professional level. Consider yourself fortunate to have her as your realtor! Hans U. Thank you so much for the tireless help and support given through the home buying process. You helped put Megan and I in the perfect home! Thank you fro being there from very start to finish. Also, huge thanks for the housewarming presents! We are putting them to good use on our movie nights! Logan C.
Thank you so much for helping me through every aspect of buying my condo. Then I was frantic and not feeling well you both helped me to take one step at a time. Your knowledge and kindness I will always remember and be thankful for. Ann M.
From the very first meeting with Karen, I felt very comfortable and at ease. The Fate Team truly goes above and beyond in every aspect. My house sold quickly and if it weren’t for the team with the builder I picked I feel my whole selling/buying experience could have been euphoric. On another note, without the knowledge and attentiveness of the Fate Team during my new home buying process, I might be homeless right now! They kept me calm with the feeling that it was all going to work out ~ and it did! Thank you Karen and Megan for everything! Treva J. Hands down the best real estate professional I have EVER worked with in the Tampa Bay area. Her combination of always being client first minded, knowledge of all aspects of both the market & transaction process and her unique added business/investment, family and life perspectives make her the most impressive, reliable and trustworthy realtor I have experienced. And that from someone who works in development in the real estate industry and works with realtors daily. For personal real estate needs, buying or selling, I could not imagine using anyone else in the Bay Area. VERY highly recommended. Alex E.
Karen Fate is a knowledgeable real estate “professional,” who keeps current on the market, is a trusted advisor, and takes a personal interest in helping buyers and sellers. She knows Tampa! She’s also very personable (and pretty!) I’ve referred clients to Karen, knowing she would find them exactly what they wanted. (She did.) I will be listing my one bedroom updated condo with a fabulous view of Old Tampa Bay in a complex that also has a marina, with her in October and look forward to spending time with her for another one. (Contact Karen if you’re interested. (That was a plug.) Dianne C.
We were totally blessed to have Karen help with both the sale of our home and with her patience to help us close on our new home. Awesome realtor and by far the best and I have sold and bought homes in 5 states. Nora B. "In today’s market buying a home, especially your first, can be unpleasant. Karen Fate made the experience enjoyable for me. She worked on my side, not the sellers, and provided me with every bit of information, good and bad, so I could make my own decision. To this day I still call her with questions and recomendations for home improvement specialists becasue she knows who’s fair and honest. Karen Fate is never allowed to retire as I will be using her services for all of my future purchases. If your reading this, pick up the phone and Call Karen….you’ll realize rather quickly you’ve made the right decision." Jack C.
"In the past few years we have utilized Karen’s services several times. We have nothing but positive things to say…she is extremely knowledgeable, honest, professional. Would highly recommend her at any time!" Mark T.
" Karen helped my family buy a house site unseen. She quickly got a feel for what we wanted and offered exceptional advice. With limited inventory Karen delivered on a house in the desired area with the characteristics we wanted. Upon closing she warned my family and I that she would not be going away anytime soon. This is where she really shined and I learned to take Karen at her word. She kept in contact and went above and beyond to help my family settle into our new surroundings. Karen helped make the our house a home. I cannot recommend her enough." Walker C.
"I have worked with Karen on a personal purchase, and another family listing and sale. I have and will continue to recommend her to out of town persons looking to relocate here to Tampa. Local knowledge is OUTSTANDING. Her responsiveness to either a sale or listing has been nothing but professional and knowledge. She explains everything from location, to taxes, to HOA fees. You will know accurate information about a property so that you can make an intelligent decision. Karen puts in the homework…EXCELLENT individual to work with." Philip C.
"We were so lucky to find you as a realtor back in 2009 when our house hunt began. I continue to be impressed with you, and am so glad we have kept in touch. I will continue to sing your praises as the fine, caring, sincere and honest realtor that you are to everybody I know. Keep up the great work!!!" Lee D.
Thank you for your time and effort to make my purchase of the townhouse a reality! Happy Holidays! Elizabeth T.
We love our new home. Thank you so much. We love you, too. Merry Christmas! Lee and George D.